Perhaps far more of a novelty though, is the lack of Glasgow School of Art alumni. Scotland’s art colleges throw up Turner Prize winners and nominees as predictably as the yearly pooh-poohing of the prize, and none more so than the prestigious Glasgow school, so it’s not without some irony that this year’s host city won’t be celebrating with a homecoming. The line-up, alas, is not a strong one, even less so than in previous years, and this may or may not have much to do with a lack of Scots. The weakest artist by far is Nicole Wermers, and I’m really not sure how she came to be nominated. Just how much art did the judges get round to seeing if Wermers and a bunch of house renovators – sorry, I did mean credible community-based-activist urban regenerators – are the result? For Wermers’ display (Infrastrukture pictured) we find a group of tubular steel modernist chairs arranged in forlorn “conversational” groups, with two placed conspicuously on their own. 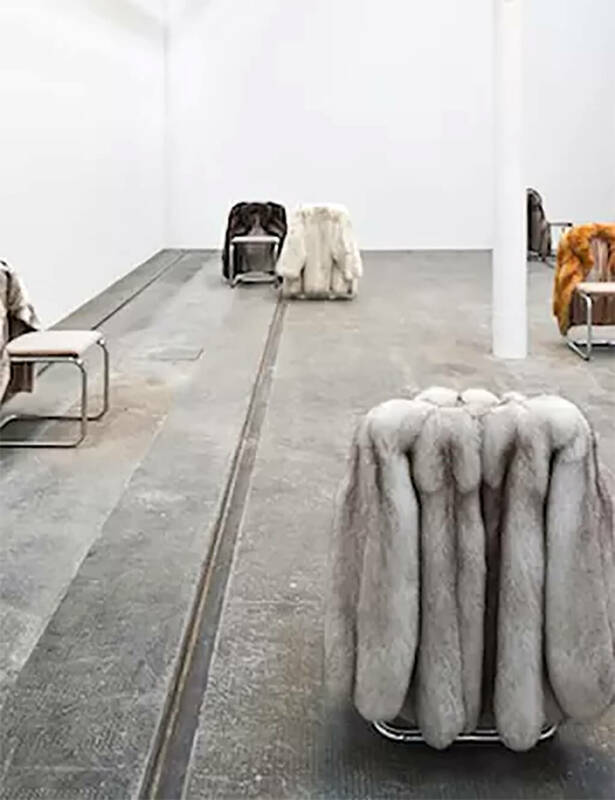 Fur coats are draped over the backs of each chair. It looks as if a glamorous but unhappy party of identikit fashion models have taken a fag break from a Robert Palmer video. But there’s more to it. The backs of the chairs have actually been removed and the fur coats stitched in their place, so the animal pelts and the leather upholstery unite as one. Singers are nothing new to the Turner Prize. Scottish artist Susan Philipsz won in 2010 with a recorded rendition of traditional Scottish ballads, and now we have Janice Kerbel’s DOUG, a song cycle for six classical singers whose elastic vocal chords are stretched to remarkable effect – to my untuned ears one male singer appears to go from “castrato” to bass in under a minute. They’re singing Kerbel’s poems about absurd accidents and incidents the body is prone to – falling, slipping etc – but you can’t understand a word of what’s being sung. And the piece is awfully, frightfully whimsical and protracted in its earnest comedy. Full credit to the singers though. If Bonnie Camplin’s The Military Industrial Complex (Patterns) sounds ominous it certainly looks dry and theory-heavy. At least initially. You’ll find a books on esoteric philosophy and the nature of reality beyond the bounds of physics, arranged on tables like flea market stock, a photocopier to print pages that take your fancy and five TV monitors arranged conference-like on a round table in the centre of the room. But then you pop on headphones and watch people share weird experiences and off-the-radar conspiracy theories. One woman mentions reptiles and the Rothschilds in the same breath, so you know where that might be heading. And if you’re in any doubt she then tells us that “the Nazi influence is heavy in my family”. It gets a lot weirder, but then this is really the stuff of Susan Hiller alien abduction territory, though far less aesthetically compelling. And perversely it’s all a little too “out there” to hold much sustained narrative interest. Finally, we have the socially conscientious design collective who might just grab the prize, and it’ll probably be churlish to begrudge them it. Assemble is a collective of 18 practitioners, all aged 30 or under, who, since they formed five years ago, have been working with residents in rundown communities to refurbish their homes. Tiles, wobbly basins, door knobs, light-fittings made of discarded bric-a-brac, rough-hewn chairs, granite fireplaces and hand-printed fabrics are all examples of work undertaken for residents at Granby Four Streets in Liverpool’s Toxteth. The group clearly work from the premise that restoring civic pride is just as important as restoring homes. And if you don’t find quite the finish you’d expect from a high-end design studio then be inspired by the thought that the wares are created in collaboration with the residents, who are trained in the skills to continue the good work. Besides, it has the community feel-good ethos that’s “very in” right now. This review first appeared on The Arts Desk on 5 October, 2015.